In the past year I’ve discovered an organic lipstick brand that has become my absolute favorite. Bite Beauty’s colors are enticing, the formulas wear well and, best of all, their products are made with all-natural ingredients. The brand has me excited once again with a new product: the Matte Créme Lip Crayon ($24, sephora.com). For me, matte has always meant uncomfortable. When I’ve applied matte lipsticks in the past, my lips felt dry and tight, but this new lip crayon delivers matte color while still feeling creamy on the lips. 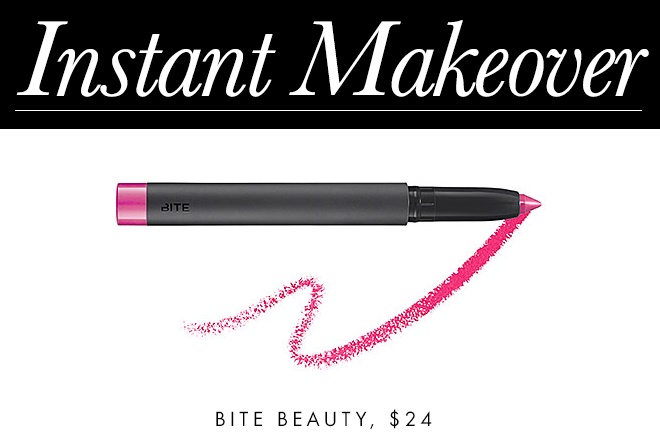 It’s also easy to apply, because it’s skinny and pointed, so you can line lips and then fill in. It comes in six bold colors that are all made with citrus peel wax. While using organic lipstick was never a priority for me in the past, I’m learning just how essential it is. With all the licking, sipping and snacking we do while wearing lipstick, we can ingest up to nine pounds of lipstick a year. Isn’t it better for that lipstick to be free of toxic ingredients?